Gotta admit, I was having a little fun last week. While Nathan's review subject of the curried chicken pot pie-type things was getting a little gruff (and rightfully so) for the abject dearth of redeemable nutritional value, mine for the super-chic and healthy riced cauliflower was flying high and wide. It's still kinda funny to me, how popular the riced cauliflower is, popular enough to not be available again until July (according to some rumors I have heard) so supply can attempt to keep up with demand. I still have a bag of it in my freezer and I'm wondering how much I could sell it on eBay for right now. 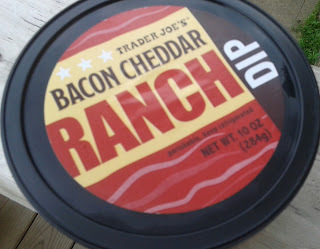 Well, while basking in any sort of perceived glow of eating healthy and all that, I kinda failed to mention to you all, until now, that Sandy and I were currently scooping our way through our second container of Trader Joe's Bacon Cheddar Ranch Dip in as many weeks. Busted, both in my pride and in my gut. Listen, there's some things that I'd *like* to be able to say in full conviction about this particular dip. As alluded to on our latest podcast (subscribe now! ), I never have been, nor will never be, a ranch dressing kinda guy. Or pretty much any salad dressing, or most condiments aside from salsa and hot sauce for that matter. I'm just not. So, the fact that this dip is, not surprisingly, about 90% full-on ranch flavored is kinda a turnoff for me. 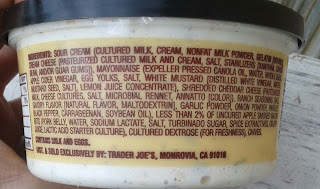 The ranchiness seems even more ramped up by some factor - not sure if that's the sour cream's doing or not - but it's amongst the ranchiest of ranches I've ever had. It drowns out any flavor from the shredded cheddar, in fact. And as for the bacon - well, it just makes everything taste saltier, even though there's not that much bacon here to speak of. 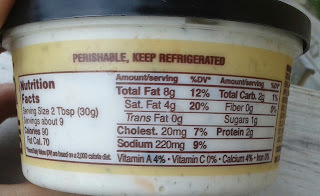 Look closely at the ingredients: it's listed under the "contains 2% or less of the following" part. I'm sorry, but when something says "bacon" as the first word in its name, I expect a lot of it. This is America, dangit. I'd also *like* to say that Sandy would be responsible for the vast majority of its consumption. Truth is, I ate pretty close to my fair share with some veggies or plain tortilla chips. Sandy probably ate more than me (I was busy on a few occasions with a pretty tasty guacamole), but to insinuate I ate none of it would be a boldfaced lie. This means I couldn't have held the dip in absolute contempt like I'd like to. I think part of it is, I was trying to like it more than I do. But I just don't. Too much ranch, not enough bacon and there's for all intents and purposes almost no cheese. I wouldn't buy it again, but if Sandy were to get it again, I'd help her out with it here and there. There's no question in Sandy's mind: it's perfect. "Mmmm" is about all I could make out from her before she almost drooled off Homer Simpson-style. It's kinda funny, I don't think I've seen her be all that enamored with ranch dressing, so there must be something clicking about this particular combo for her. I'm just not picking it up, but, well, it's not as awful as thought, despite how horrible the stats are and how generic Burger King-y the packaging is. I'll give it a half(clogged)hearted 2.